Nothing says Easter more than an adorable bunch of bunnies. And who knew you could form cinnamon rolls to look like them? They're so cute and impressive and take almost no work or pastry skills. Adults and children alike will love these sweet and cute cinnamon roll treats. They're made with store-bought dough, icing, and frosting so they're super easy to throw together. Of course, you can always go the homemade route for the cinnamon roll dough, icing, and frosting if you wish, though anything that makes a holiday breakfast easier is a win in our book. It's also a great recipe to have the kids help you make. Have them use a butter knife to cut out the ears and help you assemble them. They can let their creativity shine when you decorate them together. There's only a few steps so it's the perfect short project that will keep a short attention span going. 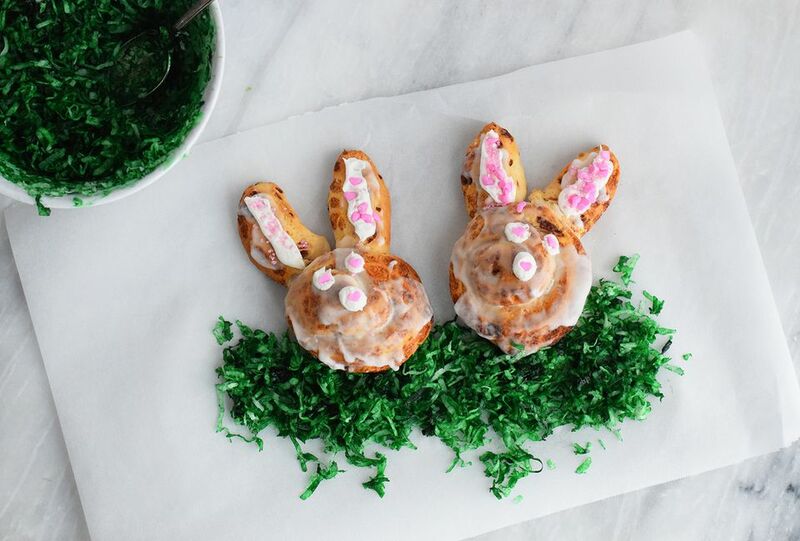 Garnish: jelly beans or sprinkles, green coconut "grass"
Unroll three of the rolls and cut the dough into 10 pieces shaped like bunny "ears." Place the ears on five of the cinnamon rolls so that they resemble bunnies. Flatten them a little if you need to make them look bigger. Bake for 15 to 20 minutes or until golden brown and puffy. Pour the icing that is included in the cinnamon roll dough package over the rolls while they are still hot. This will help the icing completely cover the rolls and give them a white sheen. Do your best to coat the whole roll in icing. If you are making homemade cinnamon rolls, you can also make some icing. It's super easy to whip together. Allow the rolls to cool and then add frosting, using a piping bag if you wish, to create inner ears, eyes, and a nose. Press pink sprinkles onto the eyes, ears, and nose. Use whatever kind you like or go for pink jelly beans instead. Serve with some cute green tinted coconut for an adorable presentation. Leave enough space in between all of the cinnamon roll bunnies on the baking sheet since they will spread out and rise as they cook. Make sure to add the frosting and decorations after the cinnamon rolls have cooled. The frosting will run if the rolls are too hot. If you want to use a homemade cinnamon roll recipe, feel free. Just roll the dough as you normally would and cut them into the roll shape. Then, unroll one or two rolls to make the ears. You want the ears to have cinnamon sugar on them as well. You can make your own frosting too if you're looking to do all the parts homemade. Try out this vanilla frosting recipe.